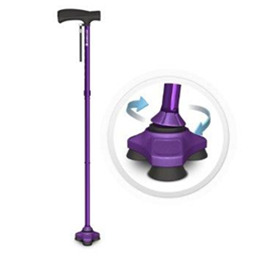 Meet the HurryCane® GO™. It still adjusts instantly to changing terrain, adjusts height with the click of a button and stands on its own. But the GO™ has important new features you're sure to love. The all-new, cushioned GoFoam handle fits virtually any size hand for unparalled comfort. And the non-folding body means your GO™ is ready to move whenever you are.